RIO DE JANEIRO, Apr 11 2014 (IPS) - The pressure to complete 12 football stadiums in Brazil in time for the FIFA World Cup in June has meant long, exhausting workdays of up to 18 hours, which has increased the risk of accidents and deaths. Nine workers have already died on the work sites – seven in accidents and two from heart attacks. The last fatal accident happened on Mar. 29 at the Arena Corinthians in the southern city of São Paulo, when 23-year-old Fábio Hamilton da Cruz fell to his death from scaffolding, eight metres up. Poor working conditions have also claimed lives in sports installations that are not on the official FIFA list. On Apr. 15, 2013, a portion of the stands in the Arena Palestra stadium of the Palmeiras club in the city of São Paulo collapsed, killing Carlos de Jesus, a 34-year-old worker, and injuring another. And Araci da Silva Bernardes, 40, was killed by an electric shock while installing a lighting panel in the Arena do Grêmio stadium in the southern city of Porto Alegre on Jan. 23, 2013. His death led to a partial suspension of the works by the justice authorities, who required proof from the company that it had corrected the safety violations. But on Monday Apr. 7, the Labour Ministry authorised a resumption of the work, because the stadium has to be ready for the World Cup opening match on Jun. 12. 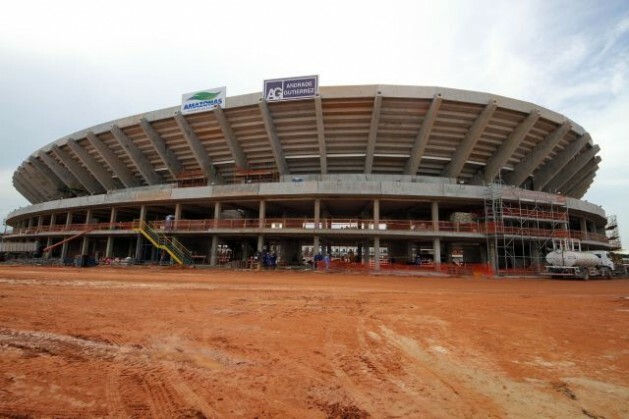 On Feb. 7, Portuguese worker Antônio José Pita Martins, 55, died after being struck on the head while dismantling a crane in the Arena da Amazônia stadium in the northern city of Manaus. Marcleudo de Melo Ferreira, 22, was killed at the same construction site at 4 AM on Dec. 14 after falling from a height of 35 metres when a rope broke. That same day, 49-year-old José Antônio da Silva Nascimento died of a heart attack while working on the site’s convention centre. The family complained about the harsh working conditions and the long workdays “from Sunday to Sunday”. Another worker, Raimundo Nonato Lima da Costa, 49, had died from severe head injuries after falling from a height of five metres at the Arena da Amazônia construction site on Mar. 28, 2013. In São Paulo, two workers – 42-year-old Fábio Luiz Pereira and 44-year-old Ronaldo Oliveira dos Santos – were killed when a crane collapsed Nov. 27, 2013 at the Corinthians club stadium, better known as “Itaquerão”. And Abel de Oliveira, 55, died of heart failure on Jul. 19, 2012 while working at the Minas Arena, popularly known as “Mineirão”, in the south-central Brazilian city of Belo Horizonte. The first fatal accident in the preparations for the FIFA World Cup happened on Jun. 11, 2012, when 21-year-old José Afonso de Oliveira Rodrigues fell from a height of 30 metres at the Brasilia National Stadium. “The government puts pressure on the companies, and they take it out on the workers, who are paying with their lives,” Antônio de Souza Ramalho, president of the Sintracon-SP civil construction workers union of São Paulo and a state legislator for the Brazilian Social Democracy Party, told IPS. “It was irresponsible to delay the works and then, with the deadline looming, kill workers with exhausting workdays of up to 18 hours,” he said. “The sins of the World Cup are going to have repercussions for years. We can’t accept accidents, they are criminal,” he said. More than 60 workers died in the construction works for the Winter Olympics in Sochi, Russia, according to the Building and Wood Workers International (BWI). By contrast, no one was killed in the preparations for the 2012 Olympic Games in London. According to the trade unionist, workers had already warned of the danger of a collapse of the crane that killed two labourers in São Paulo. At the Corinthians stadium construction site, a quarry was hastily filled to hold a crane, instead of building a solid cement base, Ramalho said. “The workers themselves and the safety engineers warned that it was unsafe. We know it was done hastily, because making a cement base takes 60 days, and would have cost more money. They preferred to improvise,” he said. The results of the investigation into the deaths have not yet been made public. In December, the Labour Ministry and Odebrecht, the contractor, signed an agreement stipulating that crane workers cannot do overtime or work at night. And under the agreement, the workday for the rest of the workers must be seven and a half hours, with a one hour lunch break, and they can only work two hours overtime per day. But according to Ramalho, the agreement is not being respected. “I filed a complaint for the police to investigate. But we have very little legal protection,” he said. One of the biggest irregularities at the São Paulo work sites are contracts where the worker is paid for a specific job within a designated timeframe. “By paying for a completed task, labour laws that include the cost of social benefits are evaded. Everyone knows this, but there’s no way to prove it,” Ramalho complained. What is clear is that when deadlines approach and time starts running out, prevention is pushed to the backburner, admitted mechanical engineer and workplace safety expert Jaques Sherique with the Rio de Janeiro engineering council. 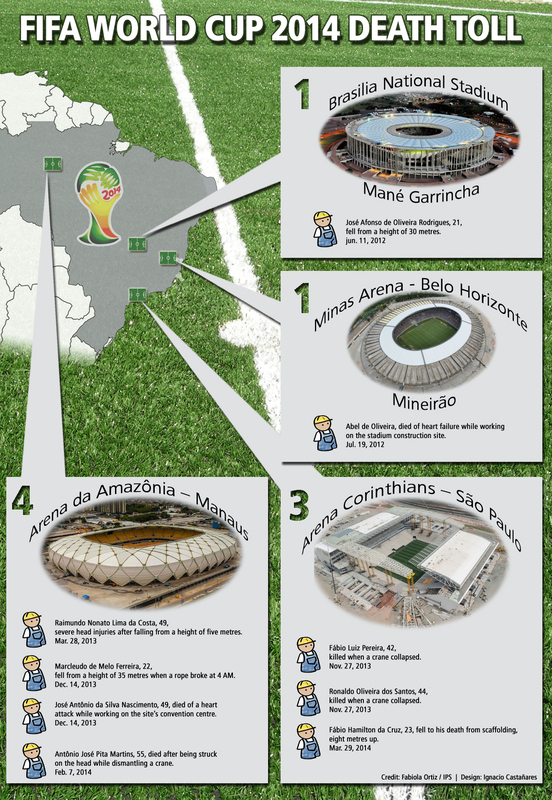 In the remodelling of the Maracanã stadium in Rio de Janeiro, completed in April 2013, no one was killed, but several were injured, mainly due to inadequate disposal of materials, cuts from mishandling materials, and lengthy working days, including working nights. “The work ends and the worker gets sick afterwards. When the stadium is shining and ready, the workers end up overwhelmed, exhausted and stressed out,” Sherique said. Civil construction is the industry that generates the most jobs in Brazil: 3.12 million new jobs in 2013. But it is also the area where the number of work-related accidents is growing the most: from 55,000 in 2010 to 62,000 in 2012 – a 12 percent increase, according to the Labour Ministry. In São Paulo, the number of workplace accidents in the construction industry rose fivefold in the last two years: from 1,386 in 2012 to 7,133 in 2013, according to statistics compiled by Sintracon-SP. More than 60 workers died in the construction works for the Winter Olympics in Sochi, Russia, according to the Building and Wood Workers International (BWI). By contrast, no one was killed in the preparations for the 2012 Olympic Games in London. “Workers are often glad when they have accidents because they are sent home to rest. And those who refuse to rest will develop injuries and ailments later on,” said Sherique. He said it is strange but the labour-related ailments that are gaining ground in the construction industry are mental and psychological problems. “It is a perverse and under-registered problem,” the invisible base of the “iceberg” of workplace safety, he said. But this does not worry industry, especially in the construction of sports infrastructure, which involves an intense pace of work, heavy pressure and tight deadlines. Under Brazilian law, workers exposed to unsafe, hazardous or unsanitary conditions must receive extra compensation amounting to six percent of their wages. “This isn’t reasonable or right, but most of the time these health problems aren’t even reported,” said Sherique. In 2011, the Superior Labour Court launched a national programme for the prevention of workplace accidents. But “it hasn’t provided concrete results,” the expert said.